The Washington Legislature will convene for a Regular Session on Jan. 9, 2017. Oregon's Legislative Session is Feb. 1 to July 9, 2017. Kitsap and Pierce counties joined King and Snohomish counties in passing secure medicine return ordinances. On Dec. 6, Kitsap Public Health Board, and on Dec. 7, Tacoma-Pierce County Board of Health, passed regulations requiring the pharmaceutical industry to pay for secure medicine return programs. Both Pierce and Kitsap programs expect to begin in Fall 2017. "The story of Oregon’s landmark environmental legislation of the late 1960s and early '70s has been told many times but a new book offers a fresh perspective from a man who was at the front line of crafting these first-in-the-nation laws." Paul Hanneman, the original author of Oregon's 1971 Bottle Bill, recently wrote a new book, The Inside Story: Oregon’s Beach and Bottle Bills, his firsthand account of crafting these groundbreaking laws. In an article in the Oregon Coast Today, Hanneman said "the book goes far beyond simply re-telling familiar storylines about the bills, and features a host of people and events that were never mentioned in those old stories... Opponents would like nothing better than to weaken or repeal Oregon’s [Bottle Bill] law! They've beaten similar legislation in many other states. But think about how much we've saved with our recovery and reuse of finite natural resources in Oregon. It's time to renew our efforts state-by-state!" 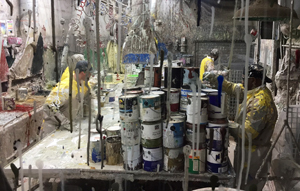 "Washington Recycles Every Day (WRED)" Paint Recycling event a big success! The Washington State Recycling Association (WSRA) held a WRED event in Vancouver, WA on Dec. 1 to explore ways to increase paint recycling in Washington State. The event opened with Kim Harless who provided information about Clark County's program – one of the few latex paint recycling programs in Washington State. The American Coatings Association's Marie Clarke spoke about the paint stewardship legislation that is expected to be introduced in the 2017 Washington legislature. Jeremy Jones of PaintCare moderated a panel featuring the Oregon PaintCare program which included SteriCycle, Tillamook County, Miller Paint, and Portland Metro, followed by a tour of MetroPaint to cap the day's events. Presentations can be found on the WSRA WRED event website. The LightRecycle Washington product stewardship program for mercury-containing lights recycled 899,871 mercury-containing lights between Jan. 1 and Sept. 30, 2016, weighing 427,878 pounds! LightRecycle allows individuals and businesses to recycle up to 10 mercury-containing lights per day at over 220 collection sites throughout Washington – find a location near you. LightRecycle is a manufacturer operated product stewardship program run by PCA Product Stewardship, a nonprofit, and overseen by the Washington Department of Ecology under the state's mercury lights law. "Three years after California, Connecticut and Rhode Island passed mattress-recycling laws, statewide programs are flourishing under the management of the Mattress Recycling Council," says Sleep Savvy magazine. The new programs in California, Connecticut and Rhode Island have "recycled 1 million mattresses and box springs since the first program in Connecticut got underway just 18 months ago... It's a remarkable achievement for the mattress industry, but it's also a big win for consumers, who now have a no-cost way of disposing of their old mattresses; a relief to states and municipalities that are keeping the bulky items out of their landfills; and helpful to companies that use the recycled components and materials to make entirely new products." The Mattress Recycling Council (MRC) is the nonprofit organization which manages EPR programs created by laws enacted in Connecticut, California, and Rhode Island. In those states, residents can drop-off used mattresses at participating collection sites, collection events and recycling facilities free of charge, funded by a recycling fee ($9-11 depending on the state) that consumers pay when they buy a new mattress or box spring. The fee provides for collection containers, transporting the discarded mattresses, recycling costs, and outreach. A new book by Dr. Helen Lewis, Product Stewardship in Action: The Business Case for Life-cycle Thinking, "describes how and why leading companies are taking responsibility for the environmental impact of their products and packaging... Unlike other resources on product stewardship and EPR, which tend to focus on the design or evaluation of public policy, this book highlights the business case for action. It argues that companies can achieve "shared value" — both public and commercial value — when they take a proactive and knowledge-based approach to the life-cycle management of their products." Writing on the Global Product Stewardship Council website, Dr. Lewis named Call2Recycle, Vinyl Council of Australia, PSI, and CalRecycle as a few of those featured in case studies or interviews in the book. Following Toxic Substances Control Act (TSCA) reform legislation, the Environmental Protection Agency (EPA) announced it will evaluate 10 chemicals "for potential risks to human health and the environment." The ten include 1,4-Dioxane, Asbestos, and Tetrachloroethylene, also known as perchloroethylene (or "perc"). EPA "must release a scoping document within six months for each chemical" and additional chemicals will be designated for evaluation... By the end of 2019, EPA must have at least 20 chemical risk valuations ongoing at any given time." The Environmental Working Group (EWG) included more information about the chemicals, their uses, and effects. A recent article in Chemical and Engineering News said that "more than 50 countries around the world have banned the use of asbestos, a known human carcinogen linked to lung cancer, mesothelioma, and other diseases. But two Western industrialized countries—the U.S. and Canada—have not taken such steps." Canada recently announced plans to ban asbestos by 2018. In a Resource Recycling piece titled "Why deposit return is EPR", Clarissa Morawski asked, "If I described to you a consumer product system that spurred green design, established a take-back channel, increased recycling, and was all paid for by the producers of products, would you call that extended producer responsibility [EPR]?" In looking at deposit return systems internationally as well as Oregon and Michigan, Morawski concludes that such systems "achieve high performance, have lower costs when based on performance and promote the transition towards a circular economy." The Washington Department of Ecology Waste 2 Resources (W2R) program is looking to fill an E-Cycle Washington Specialist (Environmental Specialist 3) position in Lacey, WA. The position is open until filled. As of October, the Washington Poison Center (WAPC) became the owner and steward of the statewide medication take back location website TakeBackYourMeds.org, which includes a new interactive map of take back locations to properly dispose of unused medicine. WAPC "will incorporate Take Back Your Meds into its existing statewide education outreach programs and harm reduction efforts." From the Product Stewardship Institute (PSI) November newsletter: Reid Lifset from the Yale University Center for Industrial Ecology is compiling a web-based bibliographic database that will catalogue 25+ years of studies, reports, and articles on EPR. The database currently contains more than 600 references. Lifset is seeking sponsors to fund some of the software development needed to make the database functional and widely-accessible, and to support maintenance. Contact Reid Lifset for more information. PaintCare Minnesota: Nov. 16 webinar recording (YouTube) and slidedeck (PDF) to review the 2016 Annual Report (July 2015 – June 2016) (PDF) and to provide an update on program activities.